I admit when I first saw this recipe I was very skeptical. Chicken and Grapes!?! How in the world could that be good? I didn’t even tell Eric that there was going to be grapes in the dinner because he flips out if there is ever anything sweet in his main course. “Fruit and sugar is for dessert not my dinner. I want something hearty and savory of dinner,'” he always says. I have tried to trick him in the past with fruit salads or sweet and sour chicken (with pineapple mixed in of course), or even Canadian bacon and pineapple on pizza but he complains and won’t eat it or will pick it out (even though he likes those foods normally). Why? You ask would I even choose this recipe then from the cookbook of the month if the end result might be a battle with my ‘picky eater’? Well the answer is merely because it has Stone Ground Mustard in it. You see I bought a big ole container of it when I made Aunt Grace’s Potato Salad and did not use as much for that as I thought I would so when I saw this recipe I deiced to make it merely on that fact. And I am glad I did. This chicken turned out great; even with the grapes. 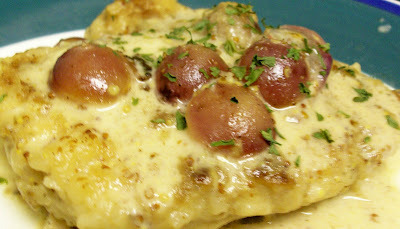 Of course Eric did not put the grapes on but after he started in the chicken with the sauce he really liked it and (gasp) went back and added grapes. Everything surprisingly worked well together and came out rather tasty- the chicken tender and juicy and the sauce very flavorful. I only made two large chicken breast (not knowing how my picky eater would react) and I regret making more! Since only making the two chicken breasts I halved the ingredients for the sauce but kept the same amount of flour- if you do all 2 lbs of chicken you will need more flour, however I halved the sauce and had more then enough! Heat a large skillet over medium to medium high heat; add 2 tablespoons extra-virgin olive oil, and 2 tablespoons butter to the pan. Place flour in a shallow dish. Season chicken with salt and pepper then dredge the tenders in flour and add it to the pan. Cook chicken 7 to 8 minutes until browned. Add wine and scrape up browned bits as wine cooks down and bubbles, 30 seconds. Add 1/2 cup stock to skillet. Combine cream and mustard and add to stock. Add grapes to the pan and turn chicken and grapes to coat and combine with the sauce. Simmer 5 minutes over low heat.